My first experience using a brine resulted in the most delicious turkey I have ever eaten. My second experience was a culinary disaster. I was at the family campground for a summer vacation from New York when I challenged my uncle to a pork loin throw down. My uncle makes money on the side cooking pork for large parties with a giant cooker that he could tow to the Grand Canyon if he had to. He is a pork cooking samurai. I was not fazed by this. After all, I was the young blood in the family who was showing a lot of promise in the kitchen with the grilled pizzas and fresh herbs that my elders had been noticing. My aunt had a whole loin thawing. I said let's brine it! She said no. My uncle would be cooking it in the roaster. This was where I got ahead of myself. I was still a couple of bits of knowledge away from really understanding how to experiment with food. But as any young and ambitious man would do, I decided to challenge a tribal elder. "Let's cut it in half. You take a piece and I'll take a piece. We'll serve it side by side tomorrow night at diner!" My uncle agreed. My aunt gave me half and kept the other for my uncle. I proceeded to get a box of kosher salt and dump about 4 or 5 cups into a gallon of boiling water with some dried herbs. I let it cool completely, then submerged the pork for an all-night bath. I had visions of my family biting into succulent pieces of pork loin so tender and juicy that they thought they were biting into a rib eye at a high-end steakhouse. The next morning, I removed the pork from the brine. I could tell right away there was something horrifically wrong. The salt hadn't created a surface barrier to lock juices in, it had cured the pork. It turned the entire chunk of meat into a salt-riddled mess. I had used about 10 times the amount of salt I needed for a brine. As I learned the hard way, the most important aspect of brining is the ratio of salt and/or sugar to water. But I was determined. The show would go on! 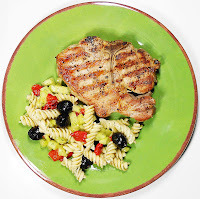 Near dinner time, I took the pork from the fridge and sliced it into chops. I grilled them and served it along side my uncle's typical award-winning loin. The salt did me in. The final cooked product, which was grilled, was so salty that it was virtually inedible. I hadn't just served a lesser product in the competition. I served a nightmare on a plate. My relatives were polite and said things like. "It's different. I'm not sure if the brine really worked." Hell no it didn't work! Two bites and you'd be dehydrated from the amount of salt in your body! I took my lumps. It was not my day for this round of culinary combat. I would like to have a rematch sometime. My skills have matured and now I can actually serve up a mean pork loin, but for now my uncle still has the title. In the paper these ran as two separate columns, both of which I was very proud of. The chops ran first and the next week were followed by the pasta salad. Space in print is limited and the meal had to be divided into two columns. But the web presents a forum where space is unlimited! For this post, I have created a visual recipe with no space limitations. It is a "poster" of the meal I intended to create. 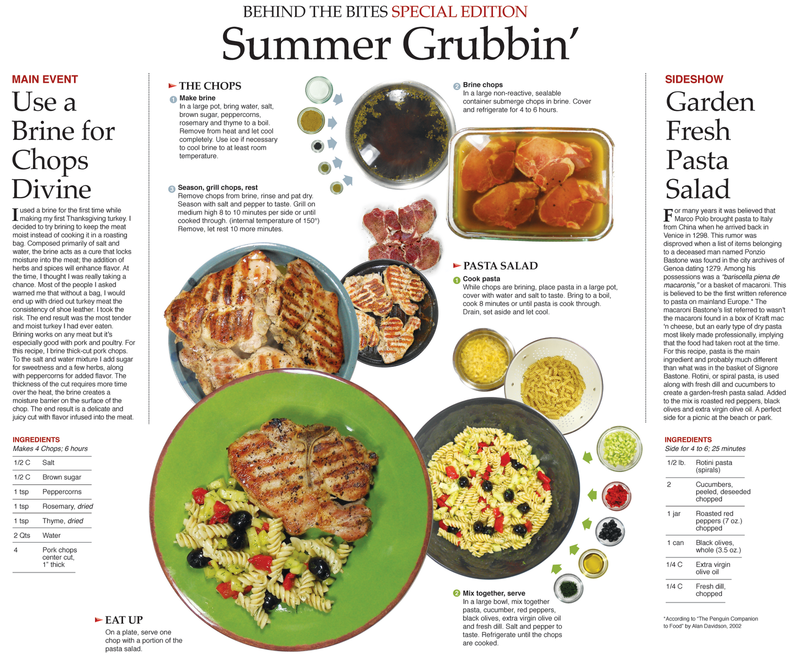 Instead of publishing my blog as individual blog post I redesigned and combined two columns as a "summer barbecue web exclusive." It just another adventure in the renegade world of being a visual food writer. This piece has roughly 500 words and 19 photographs. I have been very pleased over the last year at how my style of visualizing a single recipe has evolved. Honestly, I'm stunned with how this turned out.The combination of two recipes that appear on a single plate takes the presentation to a new level. It's visualizing a meal – not just one tasty bite. I am going to start to model my column after this. I will keep featuring single recipes, I'm just going to do them in series like this that sometimes feature meals or spreads for a party. It seems to be the next logical step. ALONG with getting a book of my first 50 columns published, of course. The chops sound great. However, I must admit I would love to have tried the petrified ones, as well! Pretty funny.